One of the major kicks i get out of living in London are all the little serendipitous encounters with art and culture you can have just by wandering around the city. 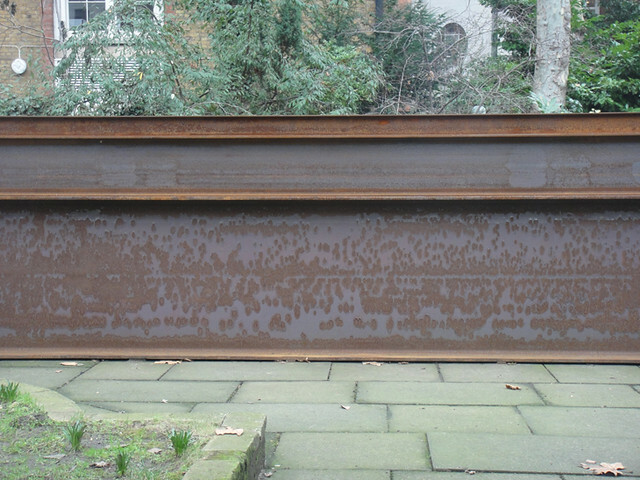 Martin Creed's sculpture is a good example of this, comprising of three rusted steel I-beams stacked on top of each other it sits in the gardens of St James's Church. I first knew of Martin Creed through his 2001 Turner Prize Winning entry titled 'The Lights Going On and Off'. I remember at the time being in my art foundation year in Cambridge and having lengthy discussions on the flaws and merits of his work. I love how Creed has attempted to put order to an otherwise chaotic, patch worked cityscape, yet he has still left the raw imperfections of the steel.